Room 8 @ Wesley Int (Archived): Creating Squares - Going into the Learning Pit! In Power Hive 8 we have had a go at this Maths Game. Only 7 of us have managed to win the computer so far, including Mr. Crowe, eventually! Have a go and let us know how you many tries it took you! Hi Power Hive 8. I really enjoyed playing this game. I was able to win the game by tricking the computer and pretending to make a square at the top of the game but I was really trying to make a square at the bottom. At the first try I didn't win but I told myself to keep on trying and I will get it. Thanks for shaaring. Hey Mandita, that is a great strategy! Thank you for sharing your learning with us too. Kia ora Power Hive 8. I lost 5 times before I beat the computer. It was frustrating to loose so much but I said to myself that I am going to train my brain to win and it worked. Thank you for sharing. I lost count of how many goes it took me to do it! Getting comfortable with tricky situations is all about training your brain to see it as learning opportnities! Well done Raymond, that is a very good thing to learn this early in the year. Hi Power Hive 8. I lost more than 10 times. Then I won. It made me feel really sad but I told myself that I need to use a new strategy to help me win. I have forgotten my strategy but will keep trying to win again. Sela, that is a great way to think about challenging learning situations! Let us know when you win again. Hello Power Hive 8. I lost 6 times before I won. It was really annoying to loose so many times but I wasn't going to give up so I made my brain think that it has to make another strategy to try and win. Thank you for sharing. Paris, I think it is really cool that you control your brain the way you do. That is really powerful! What was your strategy? Hi Power Hive 8. 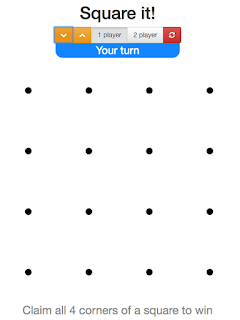 I actually didn't win because I saw a triangle shape with my dots and decided to block the computer but it suprised me and made a diamond shape, then I won. I lost 4 times before I won. Now I am going to work out a strategy to win all of the time. Jay I like that you are looking at what you could do to improve your strategy! Maybe you could do a screencast of your thinking when you figure out how to win? Talofa Power Hive 8! I lost this challenge 5 times then I won. I felt super frustrated when I lost so many times. When I won I felt happy because I thought that I should keep on trying and then that thinking helped me win. Thanks for sharing. All good Mr Davis! You have experienced the Learning Pit. In Power Hive 8 we have learned that that is what learning feels like. Kia kaha! Hi Power Hive 8! I managed to crack it on my second attempt, but man did I have to concentrate! I wonder how my class will find having a go at this challenge. Thank you for sharing your learning with us. It's me Alaskah, I hope you remembered me! I have heard that the computer can be a challenge. Well done Mr.Crowe for mastering the computer. I have been watching other kids playing this game, and its AWESOME! Thankyou so much for sharing great learning with us and keep in touch with us. Keep up the fantastic work! Hi Power Hive 8.I lost than 10 time I only won 2 time and that just made me angry.But I could use a other way to win again.I am going to show some resilient and I will find an strategy to win again.This game is fun!!!. What an amazing class you have.I haven't tried this game but I hope I would get a chance to try it,I was watching other people doing it and it seemed kind of hard because you are competing with the computer.Thank you so much for sharing this games with us I will have a go at it and I hope I win. that looks like a really hard game. It also looks like a really fun game, it would be amazing to see all of the people in your class complete this game by the end of the term. That game is quite hard for me, I didn’t even win one game! Do you think it is fun? I do. I tryed that and it was amazing how the computer could do that. It was really annoying and challenging though. Is the computer supposed to make a square or a four sides shape? Because it made a diamond for me. I really like that game It's so fun and it gets you thinking about where to put your dot and you also have to think about all the possibilities where the other person could go. How did you get that photo of the game? Wow, that was very difficult and annoying. I don’t know how many times I played that game, but I think it was a lot, it was so hard for me that I didn’t even win a game. Thank you for posting this awesome game on your blog, it was fun but very frustrating at the same time. This is a cool game and I love playing it. I have only beaten it once and I can't do it again. I enjoy playing my friends on 2 player mode. What a cool game to post on your blog. Hello my name is Emma and I am from Greymouth. I have one question how do you win? hi my name is Jordan and I am from Greymouth. Square It is really challenging for me and my friend i can't beat red.